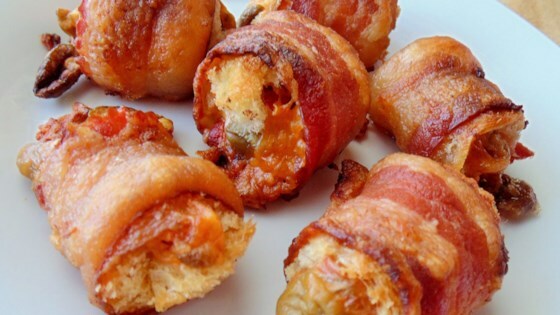 "Bacon, olives and cheese together make this an appetizer a hit. I have made it many times and everyone loves it." Cut bread into thirds. Spread each third with processed cheese sauce. Sprinkle with olives. Roll thirds jelly-roll fashion. Wrap each with half a strip of bacon, securing with toothpicks. Arrange wrapped bread rolls in a single layer on a large baking sheet. Broil, checking frequently, until bacon is evenly browned and has reached desired crispness, about 5 minutes. Great recipe that I'll be using again and again! One hint, though--make sure the bread is covered completely by the bacon or the bread will burn. The guests seemed to enjoy these, but I didn't like them! They were a bit dry and they burned too easily under the broiler. I don't think I would try them again. These are great! I have never tried them with cheese sauce though, we use cream cheese instead. These are always a big hit! this was very good! mmmmm mmmm mmmmm good. --And very easy!